Discussion in 'General Airbrush Discussion' started by 2Diverse, Mar 31, 2019. New member here. 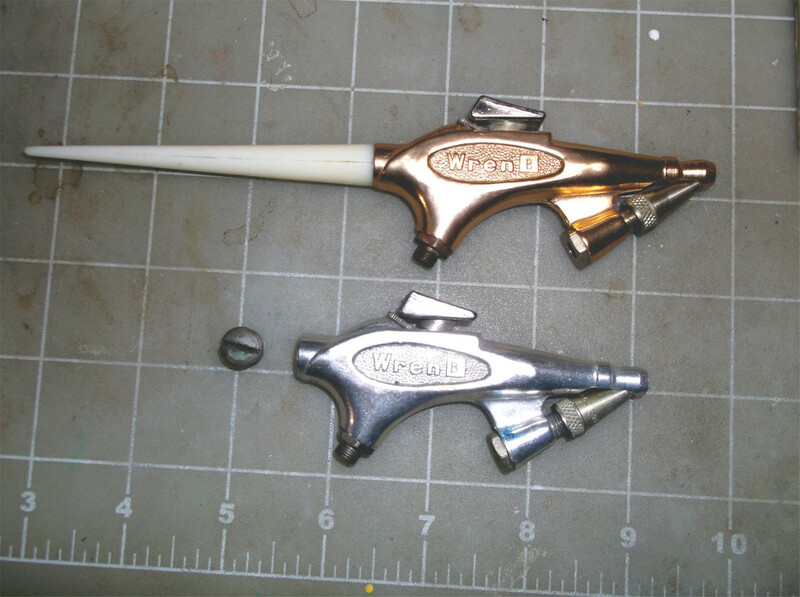 I see by reading threads that a lot of members are into the newer and well made airbrushes. That's great but I've found that they are a lot better than I am. I had an Iwata HP-BCS, kit ECL 2001, and an Iwata HP-SBS that I sold. I build plastic scale models and I do the occasional T-Shirt. My Binks Wren B and Paasche VL are good enough for what I do and I am used to them. I use Dupli-Color primers and paint on my models. I can get as good a paint job right out of the can because I've done it so long. I also spray finger-nail polish through the Binks. I have since started collecting older, uncommon and unusual airbrushes. It's not that I will ever use most of them,I just like airbrushes. My collection has been changing quite a bit lately as I buy, sell and trade them. Here are four. They aren't spectacular, just different enough for me. Thayer and Chandler model A and Badger 100XF. These are both left handed models. They are uncommon because of this. I'd be curious to know the production ratio between these and the right handed models. Rear: Paasche F2, the F2 option is no longer available from Paasche, at least it's not on their website. Paasche V.
I do try to find nice examples in good cases but I'll buy something odd without it. I'll start the discussion here so I don't ramble too much. 2Diverse. One tip. Next time copy Hotlink for forums: from postimage and you will have bigger picture in your post, and there will be no need to leave forum to see your bigger picture. It is also possible to edit your previous post like that. The hotlink for forums is the one I picked, seemed like the best choice. Don't know what happened there. Works for me. One thought about that Badger you have there... If I am right, it has a slotted head screw in the off side? I think this was a personal modification by a previous owner. The early 100's only had a hole on the right side, later replaced with a through hole with a blanking plug to block the off side. I've almost purchased a couple of the lefty Thayer Model A's, just because they are unusual by comparison. I have a fair number of the Model A's, with each one representing a change in manufacturing processes or methods. Some alterations are very minute, others more obvious - although the brush remained just about the same since it's introduction in the 1920's. 2Diverse, J000seph, Robbyrockett2 and 2 others like this. Oh, and I almost forgot - is that an OSSA as your avatar? Thank you for the response Dave. As I mentioned above, your art work is spectacular. I appreciate the heads up on the lefty Badger. You are correct with the slotted screw (you have a good eye). Seems I may have been duped then. At least I know. Live and learn and I'm still learning. Your airbrush collection is awesome too. The red handled V looks to be around the same era as mine but there is more to it than I have. The handle in the first pic is pure eye candy. Beautiful! Yes, it is an OSSA, it's in my signature. It's a Six Days Replica and an incredible story unto itself. J000seph, DaveG and huskystafford like this. I have an older model A I got from Dave I use a lot for micro shading It's my treasure piece. Otherwise my GSI in various configurations does my very most precise line work for me. The T&C model A's are good airbrushes for sure Robbyrockett2. I have two right handed and the lefty. I've never used them. What I do does not require that much precision. Being on the forum here has made me want to become a bit more well rounded in what I use an airbrush for though. It's got me thinking. I know Dave has some gabbert and I'm sure some others almost nobody has heard of. I havent quite gave up trying to get ahold of a gatti or elaga. doc1 and Robbyrockett2 like this. I haven't quite got there yet. It's kind of a latent interest. My brother goes to Colombia once a month though, I can order one to his gfs house and have him bring it back if nothing else. I've almost purchased a couple of the lefty Thayer Model A's, just because they are unusual by comparison. If you're interested, mine is available. The silver one came in the mail today. I know it's probably not a big deal to most. I bought it as in the 40+ years I've seen Wren's this is the first one I've seen that isn't the brass/gold color (my go-to is at the top). Might have been a 25th year anniversary thing? I am trying to get info on it. BTW, the plug was screwed into where the handle would go!?! yeah, my airbrush slush fund is in need of replenishment at the moment . A quick afternoon stroll through Ebay, and I realized that I got this brush from you - didn't quite look like this when I got it though (this is after my rebuild). Robbyrockett2, doc1, 2Diverse and 1 other person like this. Yep, twas mine. I just looked at my sold listings. It do indeed look different. Glad it went to someone who can use it.